Same sensor, different body - but which is right for you? Both the 650D and the EOS M have the same sensor... but which is right for you? Canon is that latest manufacturer to join the compact system camera market after what feels like years of speculation. For the Canon EOS M, the company elected to use the same 18 million pixel APS-C size CMOS sensor as found in its recently announced DSLR, the Canon EOS 650D. With RRPs currently being around the same, making the choice between the two cameras can be a tricky one, especially if you are buying your first interchangeable lens camera. We've had a look at the key similarities and differences to help make things a bit clearer. As the Canon M is not as deep as a DSLR, a new mount had to be created for the lenses. This EF-M mount is currently only directly compatible with two EF-M lenses, an 18-55mm zoom lens and a 22mm f/2.0 pancake lens. If you own any Canon EF or EF-S lenses, and you want to use them with the M, you will need to purchase the mount adapter, which comes with a not-inconsiderable £123 ($203) additional price tag. Bear in mind that Canon will be selling the M with the 22mm f/2.0 pancake lens and mount adapter as a kit package. On the other hand, the 650D of course has the standard EF mount, meaning all Canon EF and EF-S lenses are compatible with the camera. For some, a viewfinder can make or break the decision whether to make a camera purchase. If you're one of the ones who can't live with composing images on the LCD screen, then the EOS M will not be your friend. 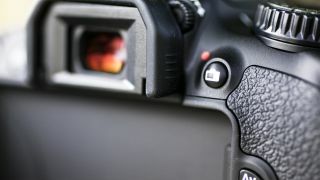 As yet, Canon says there are no plans to create either an electronic or optical viewfinder accessory for the M, but judging by the feedback over the past few days, we wouldn't be surprised if one did appear at some point in the future. Those who appreciate optical viewfinders should opt for the 650D, its finder offers 95% coverage. You can also compose images on the LCD screen in Live Mode if that's your thing. As it has no mirror, the Canon M only has the hybrid AF system that the EOS 650D uses in live view and video mode. Meanwhile the 650D also has a dedicated phase detection AF sensor that is used when images are composed in the optical viewfinder, rather than on the screen. Though the hybrid AF system, which combines phase detection and contrast detection AF, works pretty well in the 650D, it's not as fast as the phase detection system that works when images are composed in the viewfinder. This makes the EOS 650D a much better choice for shooting action and sport. The Canon 650D was the first DSLR in the world to have a touchscreen. The EOS M uses the same capacitive device. On the M, this has a much more vital role than on the 650D, as the SLR has all the physical buttons and controls that you'd expect. Meanwhile, the EOS M has around 35% fewer buttons than its nearest equivalent DSLR and much of the operation is carried out on the screen. In order to keep the size to a minimum, the M does not feature an articulating screen, unlike the 650D. Articulating screens are handy for shooting at awkward angles (for instance above the head or very low down), but also they mean that the screen can be hidden away from view when the camera is not in use. Canon believes that flash is not as important for amateurs and enthusiasts as it once was, largely thanks to better performance at high sensitivity (ISO) settings. Therefore, in another bid to keep the M's size to a minimum, an integrated flash has not been included on the camera. However, should you find one necessary, there's a small flashgun provided as standard in the box (in the UK at least) with a Guide Number of 9m at ISO 100.